Every citizen has a right to a Basic Income, a right to their share of the surplus wealth produced by their local economy. 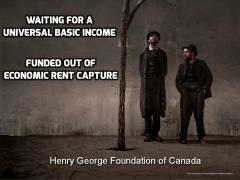 But Basic Income plans should be funded out of unearned income, NOT earned income. People with jobs should NOT be taxed to pay for people without jobs. About 30% of the GDP in every jurisdiction is economic rent, variously called the economic surplus, super profits, royalties, capital gains, unearned income, monopoly profits, or profits without a corresponding cost of production. This unearned wealth presently flows, mostly untaxed, to monopoly owners of land and resources, and to businesses with privileged access to public infrastructure like roads, the EM spectrum, stock markets and the internet. Economic rent is generated by society as a whole and thus should be captured by government to finance programs like a Basic Income (or reverse income tax -- Friedman). Basic Income recipients don’t have bank accounts in the Cayman Islands, they cycle the money quickly back into the economy. Basic Incomes appear to reduce incarceration, addition and domestic violence, and boost education, sales, and business start-ups. The cost of eliminating poverty is consistently shown to be lower than the cost of allowing poverty to continue. Poverty is bad economics. Fee and dividend carbon taxes and the Alaska Permanent Fund are Basic Income examples. “The initial results of an experiment to provide a basic income for unemployed citizens in Finland indicate that people are happier and healthier when they know they’ll be receiving a certain dollar amount every month.” -- North 99. “The basic income recipients in Finland could have avoided employment-promotion measures if they wanted to -- but they didn't.” -- Yle Uutiset. US Presidential candidate Andrew Yang is a strong Basic Income supporter. * rental value capture is green as it rewards value-added, labour intensive, resource-sparing production. * rent capture is beneficial to the economy as it removes incentives for speculation, leaving capital no alternative but to invest in the job-rich productive economy rather than the job-poor speculative economy. * land value taxation cuts mortgages roughly in half, since the purchase price of the land portion of a property is shifted to a monthly land value tax and no longer has to be bank financed or paid up front. * land value capture makes new infrastructure free. Warranted infrastructure like transit, parks, libraries, rec facilities... make communities more attractive, raising land values. This land value rise is sufficient to pay for the new infrastructure.